Many newspaper front pages on Wednesday featured a photo of President Trump with headlines that mentioned him by name. They touched on themes from his blustery speech at a rally in Phoenix, Arizona. The Arizona Republic took a different approach. In large black letters that eclipsed the font size of the masthead read the words "Violence Erupts." 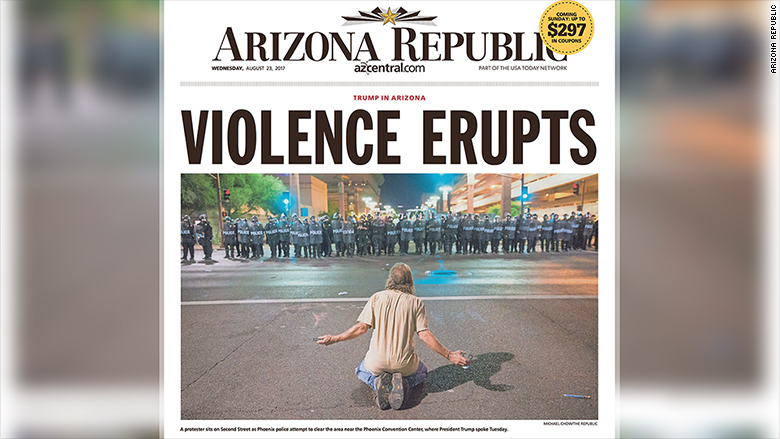 Below the headline, a photo of a protester kneeling in front of a row of police in riot gear. The Arizona Republic's news director felt it necessary to tell the story on the ground. Trump held seven rallies in Arizona during last year's campaign. Tuesday's event was the first one he headlined since becoming President. It came on the heels of a dramatic two weeks that included the announcement of a new approach on Afghanistan, and more notably, backlash over Trump's failure to denounce hate groups that incited violence at a demonstration in Charlottesville, Virginia. "This rally was different, obviously," said Josh Susong, the paper's news director who was leading coverage on Tuesday. "Because of that, we thought that the activity on the streets was also significant and different than what we have heard in the past." The lead photo doesn't just convey the news of the day. For the dozen or so Arizona Republic journalists deployed to the Phoenix Convention Center, where the rally took place, this photo reflects what they experienced on the ground, which happens to be a block away from the newspaper's headquarters. At one point, Susong received a call from a reporter on the ground who he said was too choked up by tear gas to speak. An early edition of the printed paper had shipped with a lead photo that captured the scene at the rally. After the phone call with his tear-gassed reporter, Susong realized that the story was no longer about President Trump. "From that point on and through the course of about an hour and a half, that was the way we were perceiving events outside," Susong said. What started out as a day of peaceful demonstrations turned violent in the evening. Police used tear gas to control protesters, who authorities say were throwing rocks and breaking out into fights. On the television and around the internet, people debated the merits of Trump's blistering remarks about the "dishonest media." Members of the media who work for The Arizona Republic have endured threats before. The newspaper famously bucked tradition last year and endorsed a Democrat for the first time in its 126-year history. What ensued were death threats against staffers, which means safety is "always paramount to us," Susong said. Reporters were given safety gear and instructed to travel in teams on Tuesday. "We're really proud of our staff, who covered it well and looked out for one another and for our community in the process," Susong said.